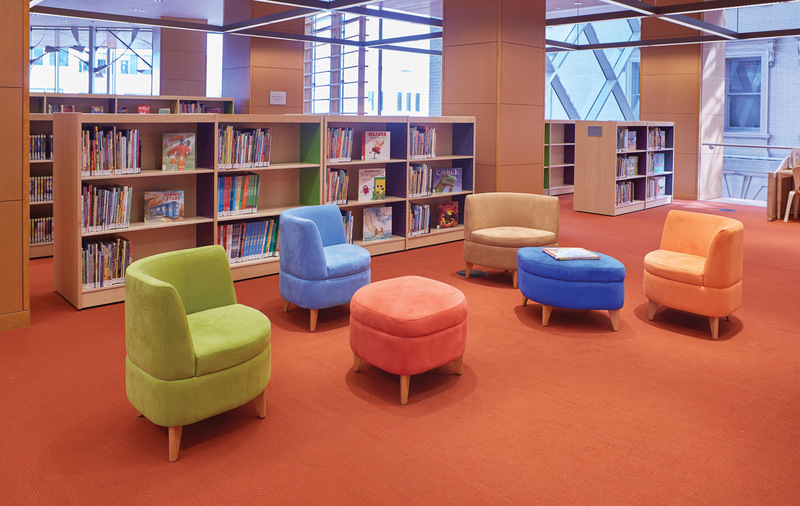 Choosing colors, fabrics and finishes for your new library furniture can feel overwhelming, but with a few pointers, you’ll feel more confident in your decisions. 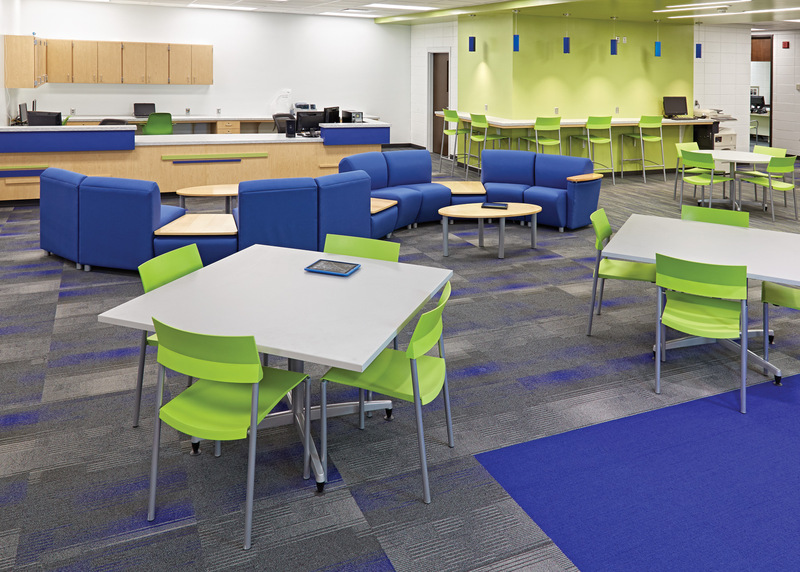 Read on to gain some advice that Jessica Mahne, Interior Design Program Director for Madison College, shared in her Demco webinar Make It Last: Choosing Colors, Fabrics & Finishes. Her introduction to the basics will start you on your way to creating a space that patrons will want to come back to again and again. First and foremost: avoid the patchwork-quilt syndrome. 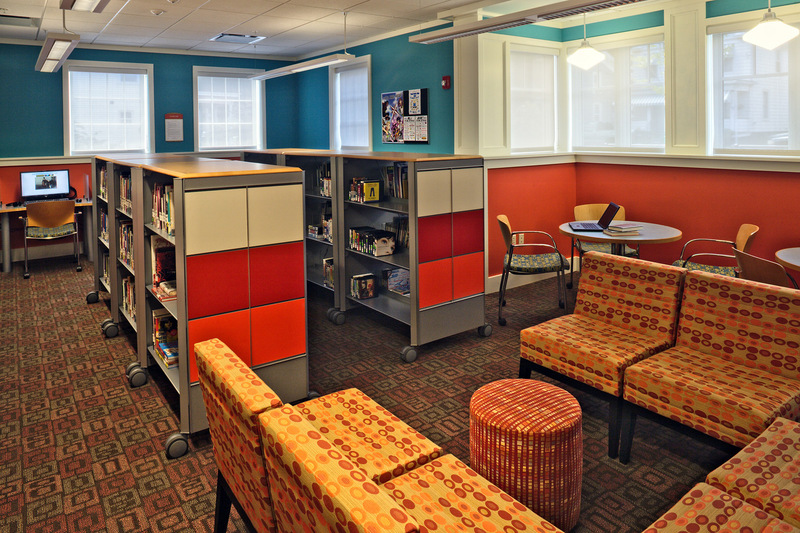 You’ll want to look for unifying elements and repetition throughout your spaces, including color. In order to determine colors that complement each other, you can consult a color wheel. We start with the three primary colors of red, blue and yellow. The secondary colors of green, orange and violet are formed by mixing the primary colors. Tertiary colors are formed by mixing a primary and secondary color, and they include yellow-orange, red-orange, red-violet, blue-violet, blue-green and yellow-green. Different variations for all the colors can be achieved by adding white, gray or black. Analogous color schemes utilize colors that are adjacent on the color wheel, such as variations of green and blue. With complementary color schemes, you’ll look beyond the primary colors and find colors that are opposite each other on the color wheel to give you a more sophisticated look. It doesn’t have to be just those two colors; pops of other colors can work well too. For a split complementary theme, you choose one color and then look for its complementary color. However, instead of using that complementary color, you use its two neighboring colors. You can add in other colors, but these should be your main colors. This can create an interesting and varied look. 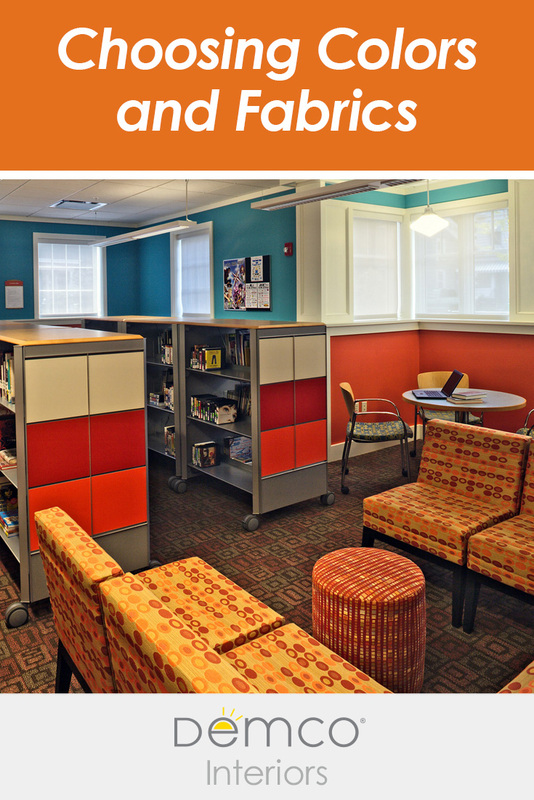 For a detailed look at analogous, complementary and split complementary color schemes, as well as advice on how you can apply them to the furnishings in your library, download Demco’s Color Palette Tool. Browns and grays are neutral colors and can be used in many color schemes. Look for neutrals that lend themselves toward your color scheme, such as a gray carpet with a violet undertone. If you use too much of a dominant color, it can be distracting. Try to follow the 60-30-10 rule: After choosing three shades, break them down into 60% of the dominant color, 30% of the secondary color, and 10% of the accent color. Color and lighting work together to form the aesthetics in a space. In an area with poor lighting, figure out if your lighting is cool or warm. Many commercial lighting areas use fluorescents, which is cool lighting. Cool-color lighting has a lot of blue in the light. So, if you use a lot of reds, oranges or browns, it will look washed out. Brighter color schemes will work better in this light, such as bright blues. Sometimes there will be a color that’s part of your existing architecture that you’re not a fan of — try not to fight it. For example, if you have laminate cabinets that are dark maroon, try to harmonize with that color and find a scheme that pulls in some complementary or split-complementary colors. Making those new colors the dominant colors will downplay the existing architectural color that you’re not that fond of. 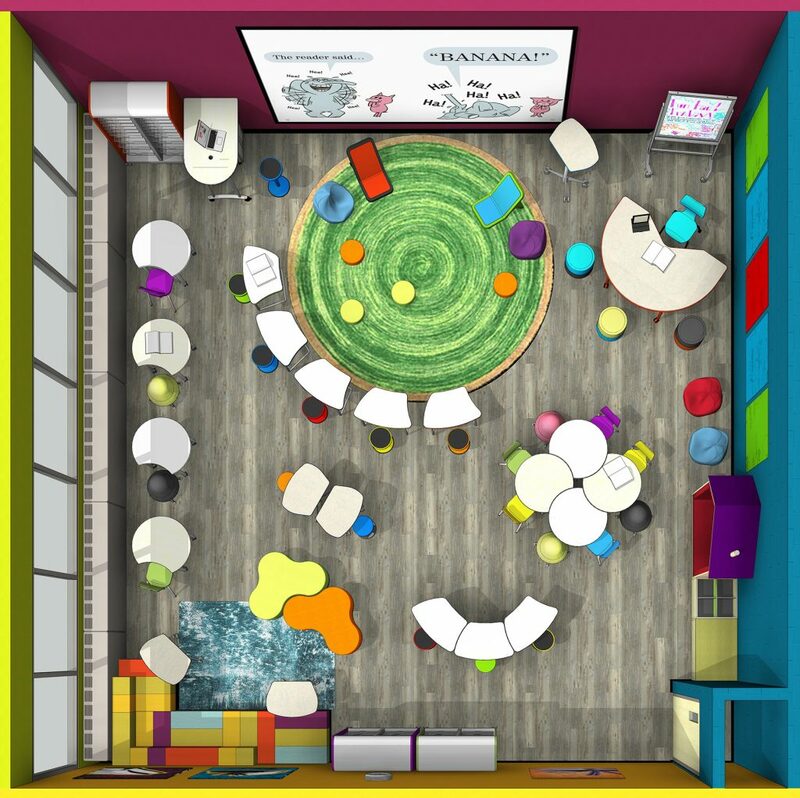 Is your library ready for a makeover? Request a consultation to have a Demco interior services specialist help you maximize your new or renovated space. Choose one dominant or common color for all the patterned fabrics. Add a little color contrast so it’s not too monotonous, such as orange and yellow accents on a blue chair. To avoid a cluttered look, choose a variation in scale for your patterns. At most, feature one large-, one medium- and one small-scale pattern in an area. One scale of fabric in a space will create a boring, monotonous feel. When choosing different fabrics that go well together, it’s helpful to look at fabrics from the same manufacturer, as they will often offer small-, medium- and large-scale fabrics in the same color scheme. 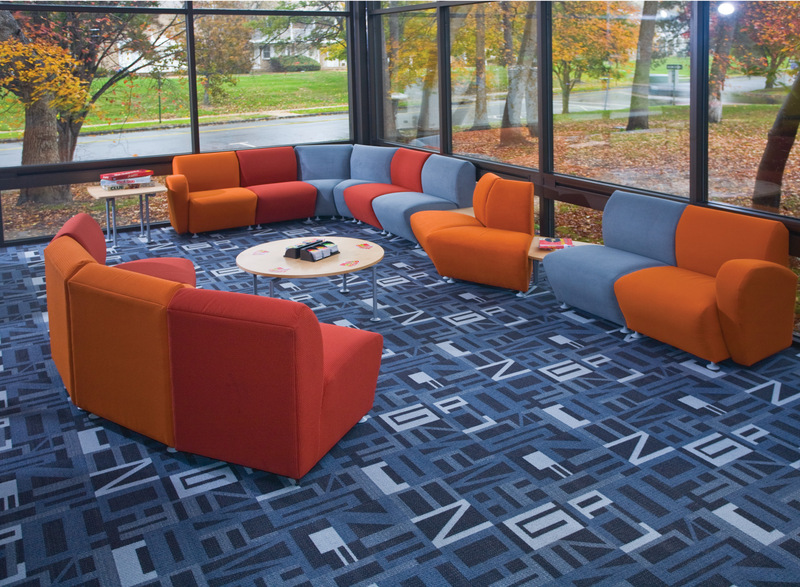 Many spaces have carpet or flooring that has a lot of bold patterning. 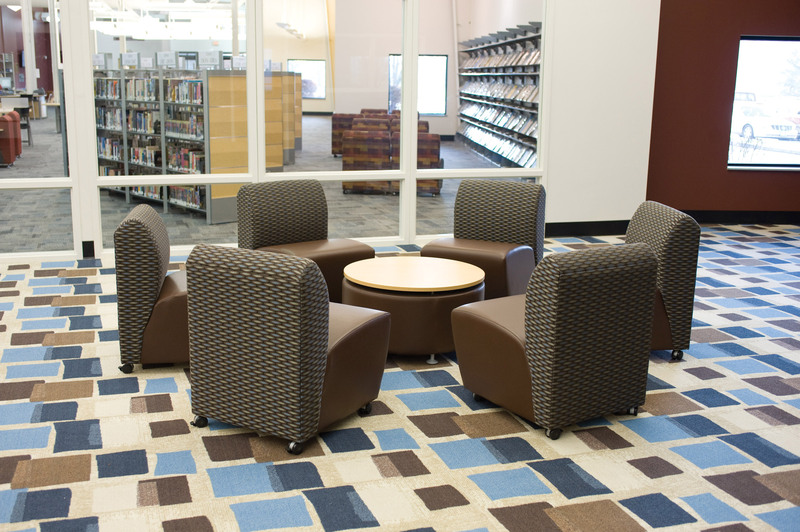 In this case, the carpet takes the place of the large-scale fabric pattern. Focus on medium- and small-scale fabrics for your furniture. When choosing fabric and furniture, you’ll also want to consider maintenance and durability factors. You want fabrics that will last a long time and furnishings that are appropriate for the activities that will take place in that space. When talking to a design professional or a furniture supplier, use the following tips to help ensure that you’re asking the right questions and choosing furniture that will last and perform well in your space. Crypton Fabrics: Crypton fabrics offer stain resistance, as the fibers are transformed with stain and microbial protection before they receive an integrated moisture barrier. These fabrics are more expensive than typical commercial-grade fabrics, but they offer high-value protection and durability. 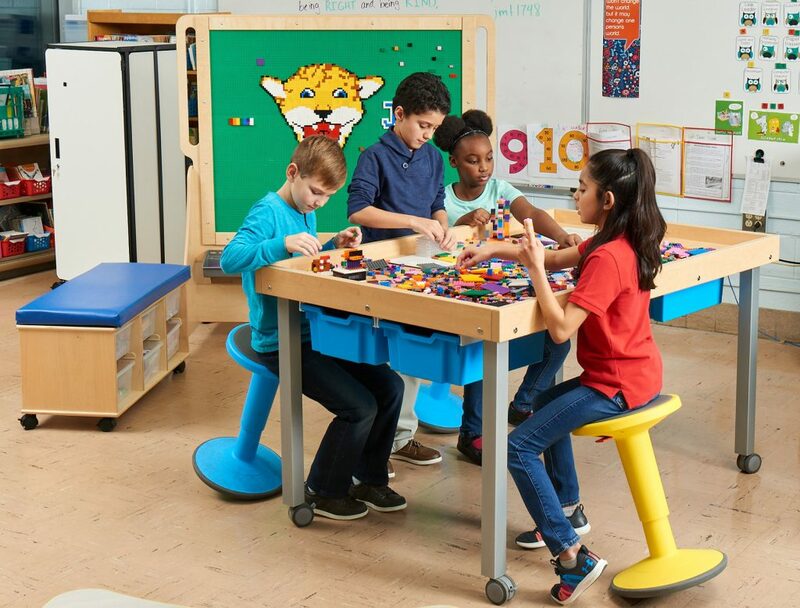 Longevity: To increase longevity, you can choose a fabric for the back of the chair, and choose a solid coated fabric or vinyl for the seat to make it more cleanable and add longevity. Double-rubs: Fabrics also have a resistance-to-abrasion factor, called “double rubs.” Every commercial fabric is rated based on a test in which another fabric is rubbed against it (the double-rub test). The tests will tell you how long and how many rubs it takes before you’ll see surface-wear on the fabric. The minimum commercial upholstery should be rated is 15,000 double-rubs; however, it is not recommended to place furniture in a public space that features a double-rub this low. 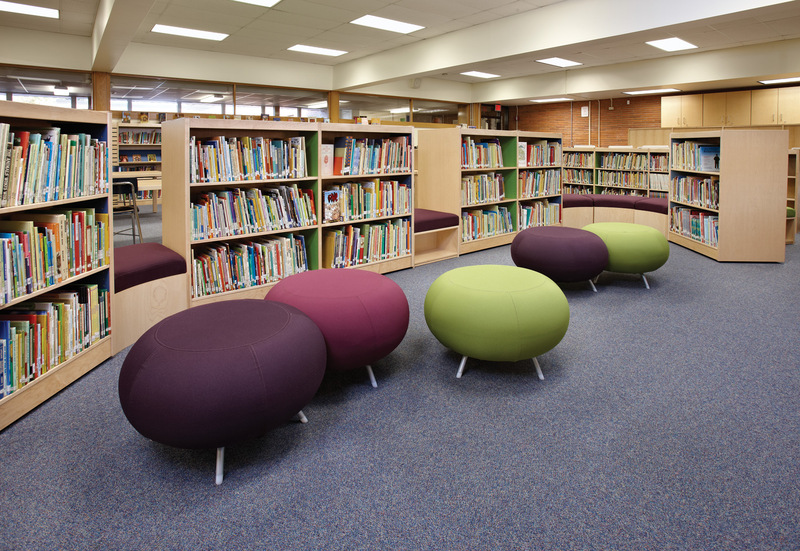 A public space such as a library should consider 100,000 double-rubs as acceptable. Exceeding 100,000 does not provide additional meaningful value. Finishes: There are also finishes that can be added on top of fabrics to make them more resistant to spills and easier to clean, such as Teflon®, Nano-Tex® or an antimicrobial finish. Different types of fabrics can accept different types of finishes. When you’re looking at fabrics, ask if there are finishes that can be added to enhance performance. 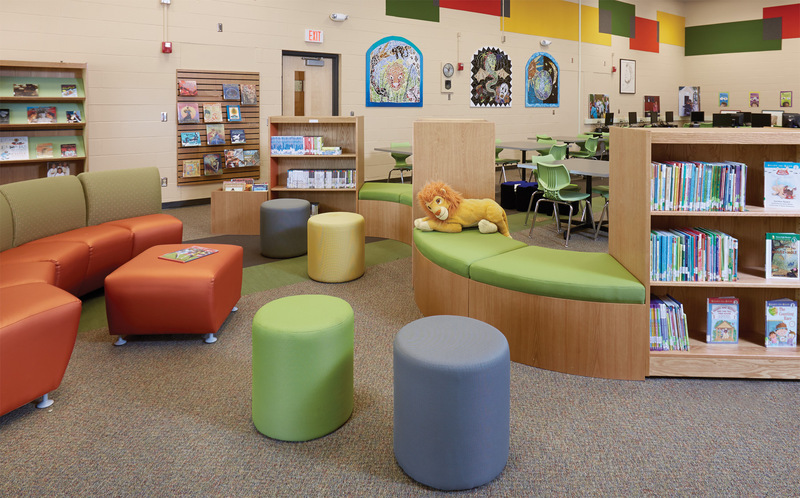 Renovating or remodeling your library is a big step, and you want to make sure you’re setting your library and your community up with an environment that will thrive far into the future. After reading through these tips, you should feel more confident in your ability to choose colors and fabrics that will set the tone for your space, complement your existing architecture and hold up to wear and tear. 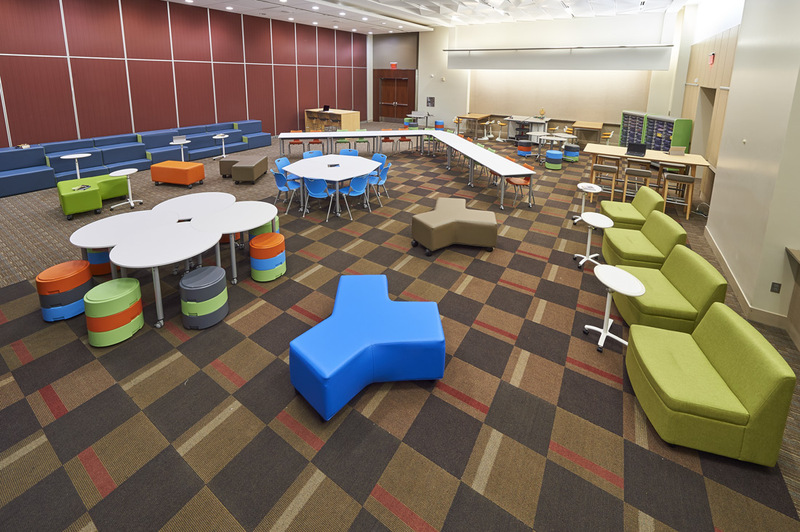 Once you get an idea of the style you’d like to pursue, a design expert can tell you the best way to execute your plan and help you move toward your library of the future.